What a lovely view ... it never gets boring! From the balcony of apartment Tatjana you have a beautiful view over the center of Vinisce and the beautiful bay with the crystal clear waters. A lovely place to enjoy the morning in peace with your cup of coffee. Apartment Tatjana enjoys a peaceful location just outside the city center (300 m) from the small fishing village of Vinisce. Here are some shops and there are several restaurants and coffee bars. The beach is walking distance (100 m) and in the immediate vicinity of Vinisce are pretty little bays with beautiful pebble and sandy beaches. The owner has 60 m away a mooring for a boat up to 8 m (fees apply). 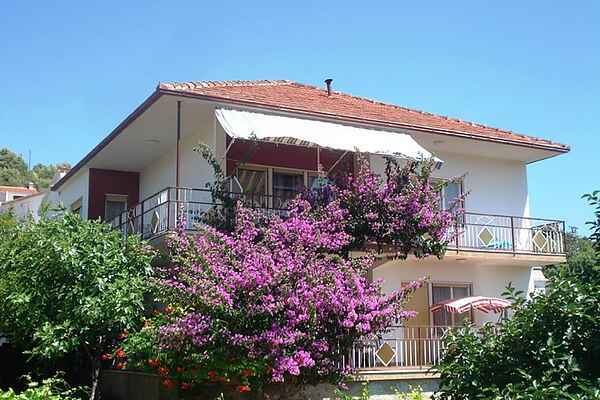 Vinisce is a peaceful holiday destination and an ideal base for exploring the beautiful surroundings. We have already mentioned as the UNESCO-protected Trogir as well as the historic cities of Split (48 km), Sibenik (56 km) and schilderachtige places like Rogoznica (19 km) and Primošten (26 km) are worth visiting. But the main attraction still remains the exceptionally beautiful coastline and numerous islands in the clear, azure blue sea! If you are looking for a place of serenity and peace, come to Vinišće which is just a 18 kilometres far from Unesco town Trogir. Vinisce is small city with beautiful cristal see, untached nature and mild mediteranean clime. There can be few places in the world where life is so safe for children like Vinišće.The natural goodness-both of the food provided from the land and sea-as well as the healthy climate and nature, these are riches which cannot be bought with money. Several bays in the surroundings of Vinišće (Voluja, Stari Trogir and Sicenica) are known for their magnificent sandy and pebble beaches, as well for their splendid underwater world, ideal for sports, fishing and scuba diving. The nearest big town is Trogir 18 km away from Vinišće. Trogir is Unesco town situated in the middle of Dalmatia. Due to its position and natural protection, it is one of the most popular sea-ports and destinations for nautical turists. Split 48 km away enternally young town with about 200000 inhabitants which give it warm Mediterranean temperament. Famous historical monuments: The Palace of Diocletian on the foundations of wich Split was born,with its 30000sq.m., represents a unique monumentof antique building. Šibenik is 53 km away.Located only 12 km away from Šibenik is the Krka National Park with its well known waterfalls, of which Skradinski Buk is the largest and most beautiful. Apartments are located on first floor in family house with beautiful sea view on bay.The apartments provides everything you need for your comfortable accomodation. Balcony lays at north-west side of house and it has beautiful sea view. House is in peacefull and quiet environment. Super close to the beach (on less than 5 minutes walking distance). Close to the recreational facilities. Close to the entertaining facilities. Apartment is perfect for seniors, couples or families because it's located in a very calm neighborhood. During the evening you can enjoy on private balcony or on shared terrace with beautiful sea view on bay.It's a great place to get away from the hustle of the big city. If this is your first time, or millionth time, visiting Croatia, you can't find a better place to stay. I know you will have a wonderful holidays here and I look forward to being your host.